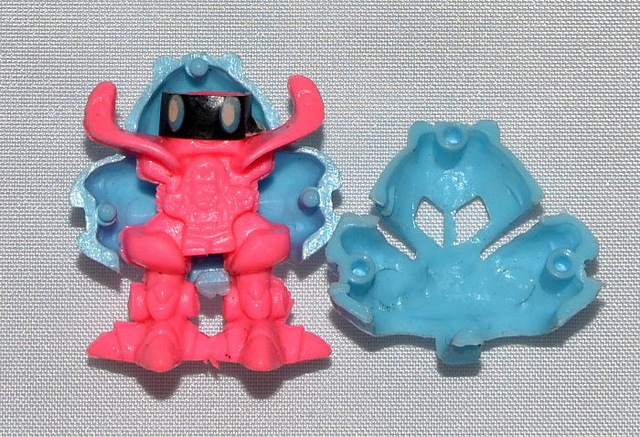 What: Here's something a bit different from the typical minifigures that have been sold in toy vending machines over the years--little soft plastic robots with removable hard plastic shells. 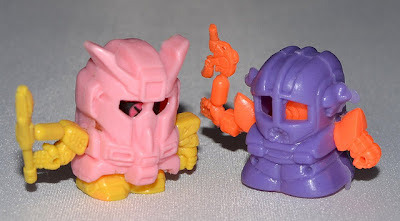 I'm not very familiar with anime and don't know what name these were actually sold under, but they appear to be some sort of "super deformed" Gundam bootlegs. 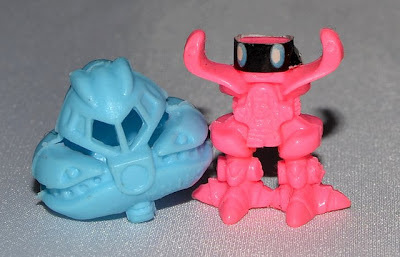 These came in a variety of neon colors, with the colors of the inside figures being a bit richer than those of the outside shells. The shells came in two pieces that you could snap together around the figure. Each figure also included a small sticker to be placed around the "head" of the inside robot. When: I got these in the mid-1990s. Where: I remember picking up a handful of these at a specific department store toy vending machine over a period of a few months. I'm not sure if I ever spotted them in another machine. Hey there--I know the ones pictured are bootlegs of Japanese Gundam figures from a vending machine, so I'm not sure they had a specific name. If they did, I'm sure it was something really generic. Good luck with your search! My buddy has a whole bunch of these. Some time we would get toy missiles instead of the little robots. It was always super disappointing. I was always amazed at how tiny their little guns were.